Welcome to Sky Roofs Ltd, a specialist flat roofing company in London. We’re your expert flat roofing contractors for fibreglass roofing / GRP roofing, flat roof repairs, liquid roofing & roof windows in London. We install flat roofs in London, Bromley & The South East, so if you have an old, leaking roof then we can help. No flat roofing job is too big or small! 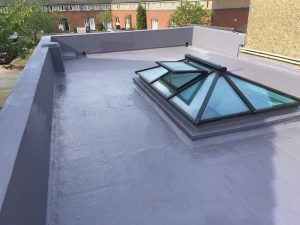 We work for both commercial and domestic customers, designing and installing efficient, cost-effective (GRP) fibreglass flat roof replacements & repairs throughout London & Greater London. 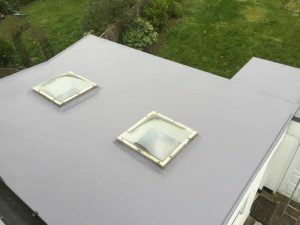 Fibreglass flat roofs provide a great alternative to felt roofs, plus we are fully insured and your new flat roof will be manufacturer guaranteed for 20 years. We offer a bespoke flat roof design service throughout London. You tell us what you would like, and we will make it happen! From a simple Protec fibreglass roof membrane, to a complete flat roof overhaul, including skylights, rooflights & roof windows for flat roofs, we are sure we can create a stunning, leak free flat roof for you! We’re your local fully trained flat roofers, specialist contractors, are approved by Polyroof Products Ltd the market leader in liquid & fibreglass roofing and warm roof systems. All our roofers’ performance is regularly monitored and randomly inspected, to ensure a continued high standard, which enables us to offer a 20 year insurance backed guarantee. Please visit www.Polyroof.co.uk for more information. If you have a leaking flat roof in London then get leak free, flat roof protection with Sky Roofs Ltd! 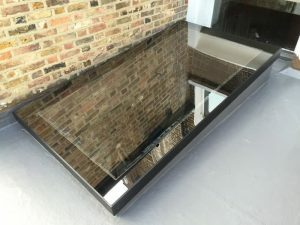 In addition to London, our roofing contractors also cover the South East so if your roof is in need of repair or you’d like a stunning fibreglass flat roof window replacement, then call us now for a free no obligation quotation.